Thanks to the Mark2Cure community, two doc sets have now been completed: Alacrima and Congenital Disorders of Glycosylation (CDG). The CDG doc set was large, encompassing over 480 biomedical research abstracts. We are launching another large set today on Oxidative Stress, and will need all the help we can get to complete it. Please visit http://mark2cure.org and login or click ‘start now’ to help. Though we are still examining the data from the Alacrima and CDG doc sets, here are some basic stats from both sets. 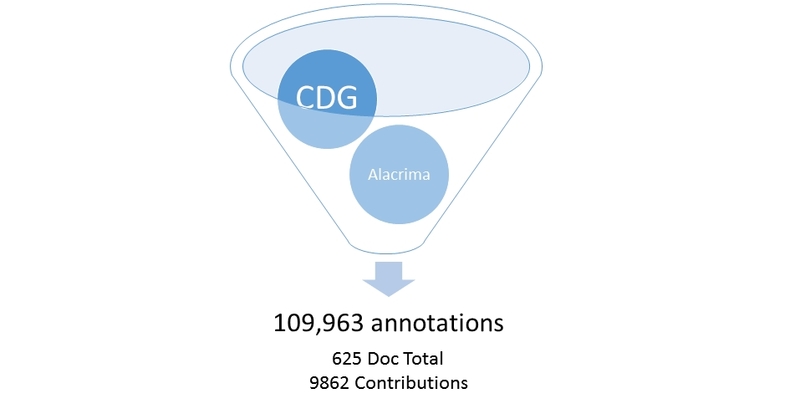 The CDG doc set was ~3.4 times larger than the Alacrima doc set and ~3.2 times more Mark2Curators were needed to complete this set relative to the Alacrima set. 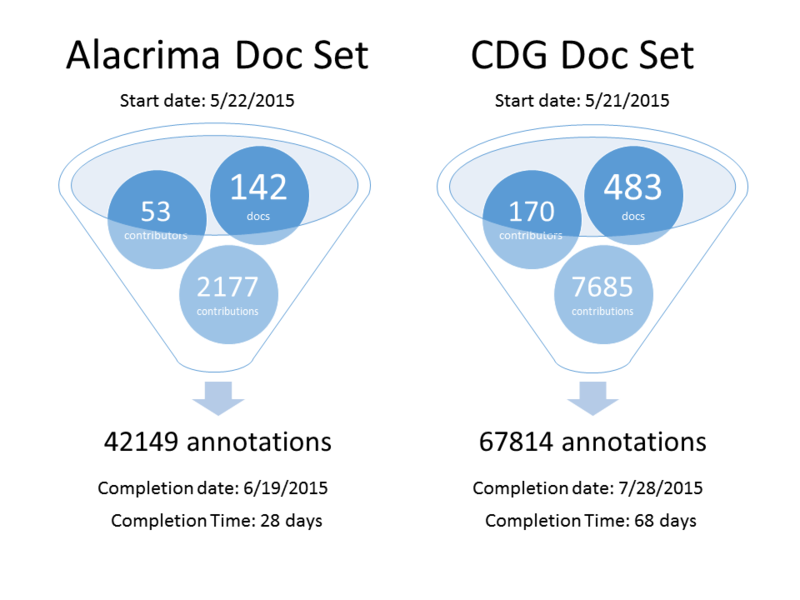 Amazingly, the Mark2Cure community completed the CDG doc set in ~2.4 times the amount of time it took to complete the Alacrima set. 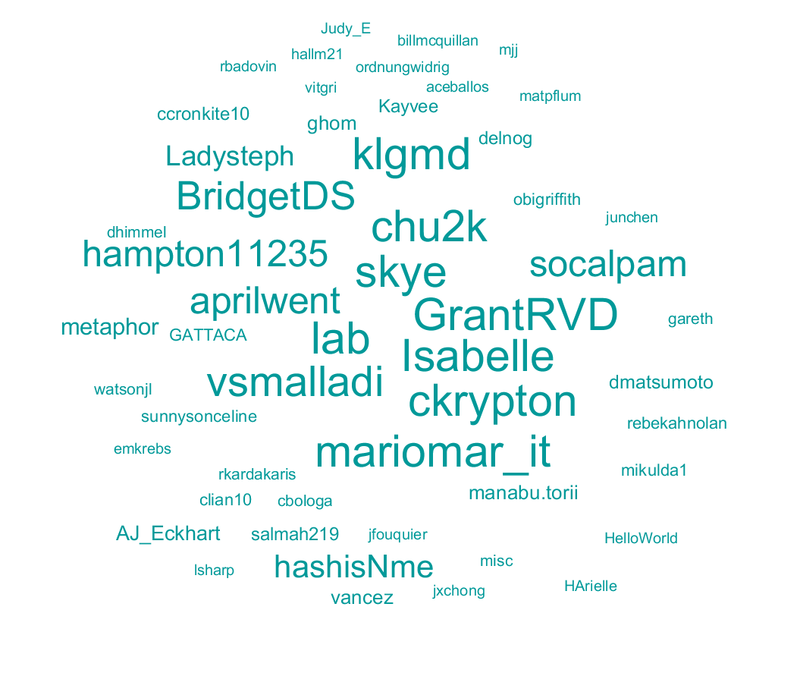 These were the contributors to the Alacrima set (font size correlating to number of contributions). We’ll have a look at the CDG doc set in a future post. Of these contributors, seven users completed all 142 docs in this set! Congratulations and thank you to ckrypton, skye, GrantRVD, klgmd, isabelle, lab, and mariomar_it for this amazing accomplishment! Two users (chu2k and vsmalladi) contributed to over 130 docs, and four users (BridgetDS, aprilwent, socalpam, and hampton11235) contributed to over 100 docs in this set. Combined, these users contributed to about 79.7% of the work needed to complete this set. Here is a quick look at some of the data pulled out of the Alacrima doc set. 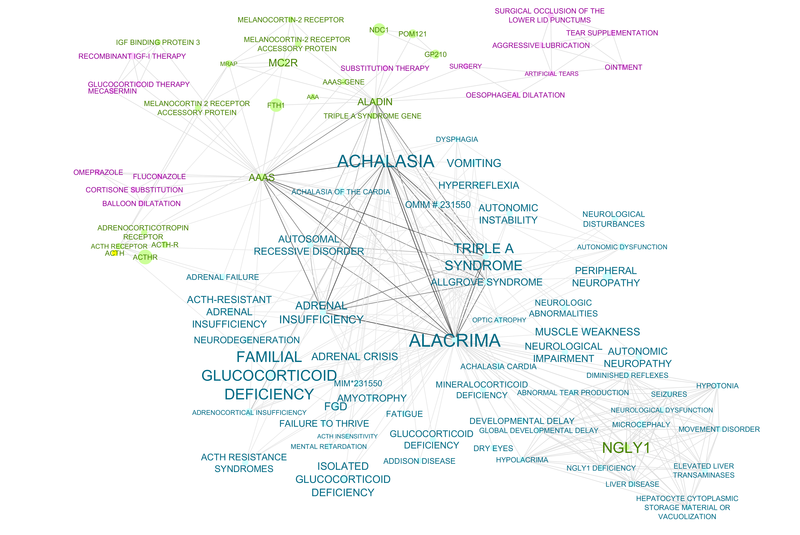 In this very preliminary draft network we can see how NGLY1 shares symptoms with another rare disease, Allgrove’s syndrome. Both diseases are linked by alacrima and neurological disturbances giving insight into how we might build a future doc set in order to further explore the relationship between these two rare diseases. What’s really interesting about this result is that that Allgrove’s syndrome was one of the diseases Bertrand was suspected to have prior to his diagnosis of NGLY1, and that ACTH (a treatment for Allgrove’s) was used to treat Bertrand’s seizures. Unfortunately this treatment had a lot of terrible side effects and had to be stopped. Overall alacrima is a rather rare and unusual symptom, and a pubmed search for alacrima resulted in a doc set that was still within workable parameters for a researcher. Although not a novel discovery, these preliminary results demonstrate that Mark2Curators not only do concept-recognition at a level high enough for the data to be useful, but also that interesting links are waiting to be found in the literature! What will you help to find next?